When Vinayaka Mudaliar (who was an ardent believer in Hinduism and a carpenter in the Nawab’s court) visited Thanjavur Palace, he was gifted by King Serfoji ll his signed Portrait (now the sign is not seen in that portrait) after Mudaliar’s request. Mudaliar liked to collect paintings,dolls from the places he visit. To mark his visit to Thanjavur Palace and his meet with H.H King Serfoji ll, he requested The Rajah of Tanjore to present him his portrait. 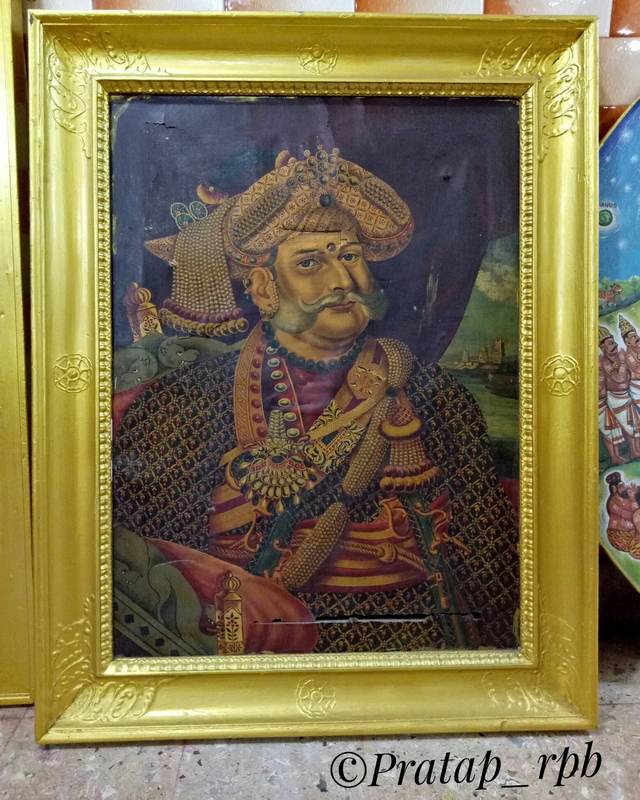 Antique Portrait of Thanjavur Maratha King Serfoji ll (seen in the picture) is well preserved and displayed for visitors at Vyasarpadi Vinayaga Mudaliar Charity, Mylapore on south side of Kapaleshwara Temple which holds as an Art gallery once in a year at the month of March/April. This house of Vinayaka Mudaliar (who lived between 1803 and 1869, was a carpenter in the Nawab’s court) now a choultry and marriage hall transforms into art gallery during Panguni (Kapaleshwara Temple) Festival. The art gallery gets lot of visitors and is crowded till it is closed because of Kapaleshwara temple car/Panguni festival (10 days) at Mylapore. The saddest thing is that many who visit this art gallery are totally not aware or know whose antique portraits are these displayed there, including the caretakers who are incharge to look after the art gallery. There are 150 years old paintings of famous kings named Swati Thirunal of Travancore, King Serfoji ll (seen in the pic), Muslim kings maybe Akbar or Tippu Sultan. Each expensive paintings of every personalities displayed there has its own history and story how it came to this house, but the history or the name of the kings in the painting are not existed or displayed For the visitors which results for visitors turning back blindly after visiting such a noteworthy place. Every year when I visit this art gallery I intentionally ask the name of the king in the portraits available there and their history to the caretakers or few visitors just to check the knowledge of our people related to Tamilnadu’s historical past and antiquity etc and the answers which I listen will displease me and sometimes shock me. That man might be thrilled and shocked if he came to know that I am his 6th descendent, but i didn’t reveal to him. When I asked one caretaker to confirm one of the names of Muslim king in the portrait, he just replied “therileye Thambi, Rombo varusama enge thaan euruku” (I don’t know brother it is here for many years). Mylapore is a place which is well known for Kapaleshwara temple, Sai Baba temple and Luz church apart from such divined places there are also many unassuming heritage places including Ramakrishna mutt,house of Vinayaga Mudaliyar even the locals there are not aware of it or its history. Steps have to be taken to remember those eminent personalities and heritage buildings and spread the knowledge about these to maximum people including the locals who are surviving there for their daily wages and locals who resides there. The house of Vysarpadi Vinayaka Mudaliar now known as “Bommai Chathiram“, houses a collection of antique paintings and hand-crafted dolls which are priceless, rare, and are of historic value. Exhibited only during the course of 10 days temple festival, the items are later locked up and kept away from the view of the public. The paintings were the private collections of Vysarpadi Vinayaka Mudaliar, who was an ardent believer in Hinduism and wanted to spread it. It is documented that nearly 70 poets sang in praise of him including Tamil Thatha Dr. Swaminatha Iyer. During his time, while the Panguni festival was on, Mudaliar exhibited his collection of paintings depicting Hindu gods and goddesses. Mudaliar was as a carpenter in the Nawab’s court. Impressed by his workmanship, the Nawab showered him with gifts, with which he bought this place next to the Kapaleeshwarar Temple. According to his Will, he desired that after his death the place be used for giving ‘annadanam’ during the Dwadasi days of the Tamil month, and opening a religious art gallery during Panguni Festival to promote Hinduism. On other days, it was to serve as a marriage hall. How did King Serfoji ll’s Portrait came in his collection? When Vinayaka Mudaliar visited Thanjavur Palace, he was gifted by King Serfoji ll his signed Portrait (now the sign is not seen in that portrait) after Mudaliar’s request. Mudaliar liked to collect paintings,dolls from the places he visit. To mark his visit to Thanjavur Palace and his meet with H.H King Serfoji ll, he requested The Rajah of Tanjore to present him his portrait.